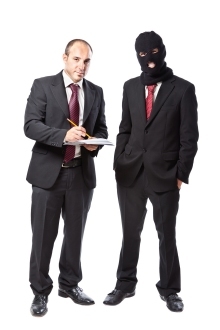 How Big of a Problem is Employee Theft and Fraud? How much does employee theft and fraud cost U.S. businesses each year? Estimates range from $20 billion to $50 billion, making it one of the most costly and widespread challenges faced in today's business world. In this first installment of our two-part article, we'll give you an idea of the scope of the problem, including some statistics on how it affects companies in all industry segments. The second part will include suggestions from experts on how to protect your business from employee theft and fraud. Payroll Schemes: falsifying time-cards to receive compensation for a greater amount of hours than actually worked, or writing payroll checks to "phantom employees." Time Theft: one of the most common forms of employee theft, this crime is committed by using company time to conduct personal business. How much does employee theft and fraud cost U.S. businesses each year? Estimates range from $20 billion to $50 billion! The typical organization loses 5% of its revenues to fraud each year. The median loss in the cases in their study was $140,000. More than one-fifth of these cases caused losses of at least $1 million. The frauds lasted an average of 18 months before being detected. The smallest organizations suffered the largest losses because they typically employ fewer anti-fraud controls. In addition, fraud affected small businesses disproportionately because they have fewer resources to act as a financial cushion. Occupational fraud is more likely to be detected by a tip from another employee than by any other method. The average embezzler in this study stole nearly $25,000 per month from their employer. About 68% of the incidents were committed by employees who held finance, bookkeeping or accounting positions. The average scheme lasted 4.7 years. The most common embezzlement scheme involved the issuance of forged or unauthorized company checks. Only 4% of the cases involved perpetrators who had a prior criminal/fraud history. Nearly three-fifths (58%) of the incidents involved female perpetrators. However, male perpetrators, on average, embezzled nearly 3 times as much as females. People aged 40 - 49 years were the most frequent culprits. While another recent study surveyed losses in the retail industry, its findings could apply to many other types of businesses as well. The 2012 Retail Theft Study conducted by loss-prevention consulting firm Jack L. Hayes International asked 23 large retail companies to assess the impact of employee theft and fraud. The stores reported that one out of every 40 employees was apprehended for theft in 2012, up 5.5% from the previous year, and thefts totaled more than $50 million, an increase of 7.0%. They found that employees with less than a year on the job, and part-time employees with no vested interest in the company, were most likely to steal from their employer. Interestingly, the average theft by a dishonest employee was more than 5.5 times the amount stolen by a shoplifter ($715.24 vs. $129.12). According to the study by the ACFE, "The nature and threat of occupational fraud is truly universal." Since the average fraud scheme is not detected for 18 months, you may be a victim right now without even realizing it. Can you afford to lose 5% of your revenue to dishonest employees? In Part 2, we'll discuss some of the controls you can put in place to help protect your company.